Do your kids like playing with cardboard boxes and doing creative projects? Then they’ll love Makedo! The genius Australian toy company creates kits that help kids make their own toys by repurposing boxes, egg cartons, plastic containers, old CDs, lids, fabric and other found objects. Makedo kits are packed with recyclable plastic pins, hinges, clips, a safe-saw for punching holes or cutting cardboard or plastic, and instructions or an inspiration poster. Right now we’re giving away a fantastic prize pack that promises hours, days – even weeks – of fun! One lucky winner will get a Find & Make Plane, Find & Make Space Pod, Find & Make Shop and two Free Play Kits for Three (family-sized sets of connectors) – a total prize package worth $155! Keep reading to find out how easy it is to win! Here’s how to enter to win a Makedo Green Craft Toy Prize Pack Worth $155! 2) Like Inhabitots on Facebook. For extra karma, check out Makedo while you’re there. 3) Add a comment to this post with your answer to the following question: What’s the coolest thing you and/or your child have made with a cardboard box? NOTE: Please be patient – comments don’t appear instantly because they must be approved. Contest ends Wednesday, May 23rd, 2012 at 11:59 p.m. EST. Open to US and Australia residents only. Winner will be announced in our newsletter on Friday, May 25, 2012. Good luck! using a medium sized appliance box, my son and i built an airplane that he could sit inside of. I've done a lot with cardboard for my cats, but as my son is only 8 months old, we haven't introduced him to cardboard play yet. I'm really about the space pod and shop kits for when he's older, though! We made a girl robot! My daughter is 7 months so we haven't gotten creative yet but I aimagine we certainly will! I love finding fun uses for items we already have and want our little gal to stretch her imagination! I've successfully made a very nice robot costume for my children for Halloween using cardboard boxes. We use cardboard boxes to kill all the weeds in our garden! We attached a box to the side of a tree and collected things from the garden to furnish the 'tree house'. I would love to have these, I have four creative kids who love to try new things. Thanks for the chance to win. We have made a mailbox out of a sturdy moving box and are about to make an ice cream shop stand that could be used as any sort of pretend play shop. Plus, my 4 year old loves boxes so much for making things, anytime we get a delivery in a box she asks me for the box to try to make something. She would absolutely love this makedo prize! When I was young, my mother made me a beautiful Indian Princess dress out of lightweight cardboard...prity much the most awesome thing I've ever seen. Now that I'm the mom, we've made a rocket ship playhouse out of cardboard as well as a dinosaur costume. I've also made a barn for their little toy animals. We made a house once with a bedroom in it. Yippee, can't wait for the next MakeDo product, My girls have made a castle (a bid Fed Squarish if I do say so myself) and also a rocket and a bed for our new puppy Ziggy. I made a robot costume for my son and it was featured on Inhabitots! A mailbox with separate slots for outgoing mail, incoming mail, packages, and "snails". A boat with a mast system that could really float (waxed the bottom to make it waterproof first, then tried duct tape). A tiny village from cardboard boxes, painted and decorated, complete with yards and vehicles and animals (NO people allowed!) roaming the yards or peeking through doors and windows (lit up from inside with Christmas tree lights). But my favorite cardboard box projects are the ones that my son (4 and 1/2) makes mostly by himself, with only a little input from me (I observe, but I only help when he asks). Sometimes robots, sometimes cars or trains, very often, though, things with made-up names that don't look like anything in particular, but are brilliant anyway because he made them himself. "It doesn't have to BE anything," is our motto when it comes to arts & crafts! We made a whole 'city' of different shaped boxes, with windows and doors, all lined up on streets! We do have a large basement where we were able to do it and the kids loved it! the coolest thing we have made from a card board box was a train, we got a deep freezer and the box it came in we cut small holes on the sides for windows and put smaller sized boxed behind and taped them, they played in the yard with it for hours. we also colored it and named it thomas. lol. crafts are apart of our daily lives, we never throw away any boxes or plastic things that can be reused to make some awesome playtoys!!! <3 this! TY commented, like both pages, and just subcribed! TY! the coolest thing we have made keeps evolving..its a fort in our basement. My husband is a builder and brings home appliance boxes for my daughter and her little friends. The fort has taken many different forms over the past year, but they are having a a blast. A shadowbox with an underwater them made from a shoebox was the best thing my kid made for a school project. She even painted the background with blue paint and used good glue to hold objects in place. We transported it to school very carefully. We made a cardboard sled of Eric Carl's hungry caterpillar for us to ride in in a sledding contest. we made our own barbie dream castle. it was huge and there were no tiny pices to worry about. it lasted quite a while until we turned it into a gi joe fort. We haven't made anything out of a box yet...dd enjoys playing in them as is! She loves being pushed around in the the bigger boxes like a car (she does this in the laundry baskets too!). We made "chairs" in the grass to enjoy a sunny day!! Isn't the cardboard box....but the faces of my happy kids :+) how a little thing that we sometimes consider insignificant can help transform a day into a gorgeous one!! We make everything we can think of from cars to houses and even pretend fish tanks. We made a doggy house for our chihuahua, Chloe. We made a tent out of the box much better than just blankets!!! My son is only 9 months old, so we haven't broken out the cardboard boxes yet. But when I was a kid, I had a grand old time making intricate cardboard playhouses for my cats. I hope my son will enjoy it too, as it's a great rainy-day activity. I think the coolest thing we made with a cardboard box was a clubhouse/fort. We had SOOOO much fun! I adore how creative my kids are with boxes. Within an hour, a simple box can be a teddy car, a robot suit, a shopping trolley, a helmet, an insect habitat, a hospital bed and a treasure chest. We made a playhouse for the cats! What a great idea. My Five year old would love this. He's an avid cardboard architect. My favorite creation of his from cardboard was when he created a dog house for the neighborhood stray out of card board and a brick. Soo sweet! In high school, I added suspenders to an empty Tide box, threw on a turtleneck and pair of leggings, and made an easy and unique Halloween costume. We made a giant playhouse. Still have some decorating to do. Already subscribe to your newsletter and like you on facebook. Forts and tunnels are always a favorite. But we also used cardboard boxes at the base for our gingerbread houses. He loved it so much we made one nearly every weekend for the 3 weeks before Christmas! A simple princess tent with a sheet attached in the middle to a branch and held at the bottom with tins - voila! We made a workstation, HIS workstation, now he owns his own desk and chair made all with cardboard the desk supports the laptop and the note books and the chair is useful even for me! I'm sure it's been said already, but the coolest think we've made is a fort. My daughters are very imaginative and cardboard boxes are the perfect outlet for them. We made robots ... but I always ask the kids were the arms / eye holes etc should be and they end up walking around with their eyes at their tummy ;))) It's really funny watching them contort so they can see through the holes! We love to make planes, cars a castle and a space ship. we made a boat out of a cardboard box that my son painted yellow so i attempted to turn it into a bananamobile (in richard scarry fashion) for his last birthday. it looks more like a boat than a banana, but my son still has fun playing in it. The coolest thing we have made from a cardboard box is a guitar, although there have also been cars, baby cradles etc. Do your kids like playing with cardboard boxes and doing creative projects? Then they'll love Makedo! The genius Australian toy company creates kits that help kids make their own toys by repurposing boxes, egg cartons, plastic containers, old CDs, lids, fabric and other found objects. 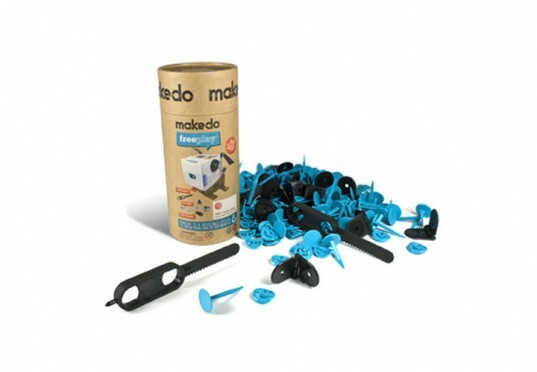 Makedo kits are packed with recyclable plastic pins, hinges, clips, a safe-saw for punching holes or cutting cardboard or plastic, and instructions or an inspiration poster. Right now we're giving away a fantastic prize pack that promises hours, days - even weeks - of fun! 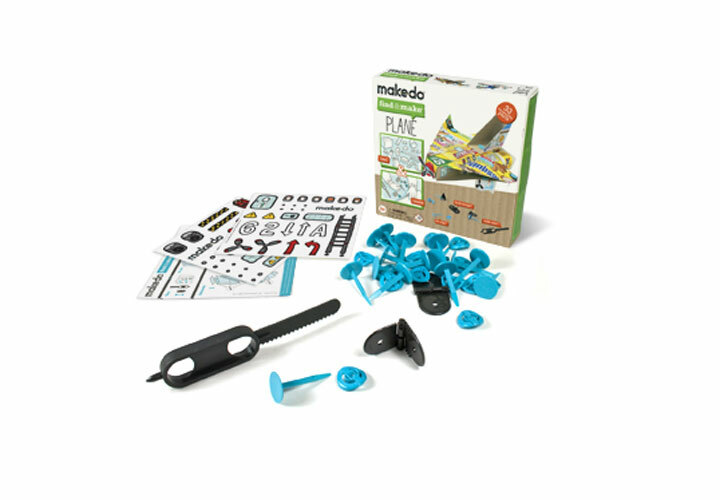 One lucky winner will get a Find & Make Plane, Find & Make Space Pod, Find & Make Shop and two Free Play Kits for Three (family-sized sets of connectors) - a total prize package worth $155!�Keep reading to find out how easy it is to win!